Tennis elbow, also known as Lateral Epicondylitis, is a common condition characterised by pain at the outside of the elbow with movements of the wrist and hand. The pain is usually localised to the tendon of a small muscle of the forearm just below the elbow called Extensor Carpi Radialis Brevis (ECRB). This muscle is responsible for extending the wrist back into a “stop” position and is active when gripping and moving objects. While the term ‘tennis elbow’ is used because this is a common injury for tennis players, anyone who performs repetitive tasks with their hands and wrists can be susceptible, including office workers and manual labourers. The cardinal sign of tennis elbow is pain felt on the outside of the elbow, particularly when making wrist movements or when gripping an object. Symptoms may occur suddenly or appear gradually over time. In the early stages, pain may be present with activity and quickly go away with rest, however, as it progresses the pain may be more constant, lasting for longer and occurring with smaller movements. If pain has persisted for three months then it is considered to be a chronic condition. As with most injuries, the longer an issue has been present, the longer it usually takes to resolve. Other symptoms can include night pain, stiffness in the elbow and forearm, weakness, numbness and pins and needles. As symptoms progress, simple tasks such as lifting a cup can be painful, which can have a significant impact on your lifestyle. While tennis elbow was originally thought to be due an inflammation process, it appears that this is not the case, rather there is an increased sensitivity to the area along with changes to the blood supply and disorganisation of the collagen fibres that make up the tendon. These changes are an adaptation to excess loading of the tendons attaching to the elbow, particularly the ECRB. Most of the time, this happens because of small repetitive movements that are done with poor ergonomics or technique. 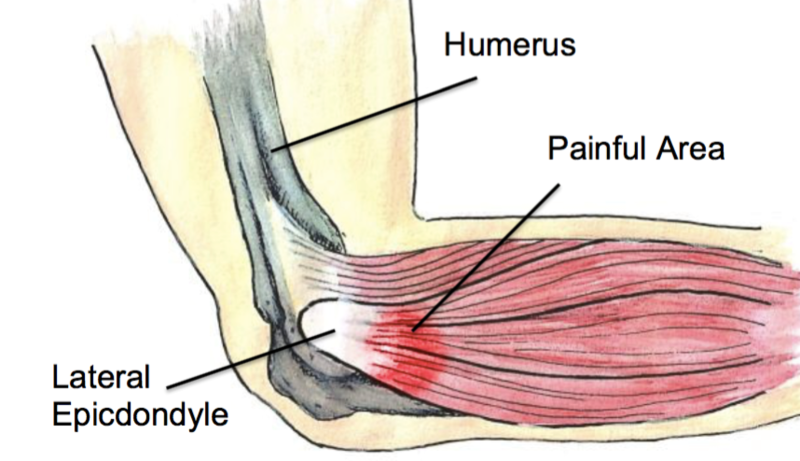 If the health of the tendon tissue is compromised, this can also contribute to the development of tennis elbow. Poor nutrition, disuse, inflammatory diseases and ageing can all mean that the tendon is less able to adapt to forces and are a risk factor for the development of tennis elbow. Your physiotherapist will first confirm that you are indeed suffering from tennis elbow, which is an important step as some neck conditions can present with similar symptoms. Once the diagnosis has been confirmed, they will determine the severity and causes of your particular condition, likely testing your grip and individual muscle strength. and joints stiffness that may be contributing to your condition. Treatment may include, fitting of a brace, dry needling, strengthening with eccentric exercises and stretching. Depending on the cause of your tennis elbow, your physio may suggest some changes. This could be in the setup of your desk, workplace, or grip technique of your racket or hand-held tool. Eccentric exercises load the muscles in a very specific way and research has shown that these exercises can help strengthen tendon tissues, reducing symptoms of tennis elbow. It is normal for tennis elbow to take a few weeks or even months to heal. If conservative management is not having a good effect, your physio can help you speak to your doctor about other management techniques. As tennis elbow is a progressive condition that generally does not resolve on its own. Because of this it is recommended to seek treatment sooner rather than later, as recovery is much faster when started early.